As a follow up to yesterdays post here are a few pictures I took from the museum/exhibition hall. Alas due to the horrible lighting in the glass cabinet few pictures are worth showing. Most of these are taken from a display from one guy. Annoyingly I can't remember the name and the WHW pages on the GW website doesn't give any info. However the models on show were well worth showing. Fantasy Chaos, with quite a fair bit of Nurgle, which was nice. You can make out the hair that was added. Skin Wolves - the pic I took from the front was horrible. Note the added arrows. Very nice. So lovely you just want to stroke it. For the Daemons I picked up some reinforcements in the shape of some Plague Toads which I will be using as Beasts of Nurgle. Will need new bases though as they are too big for 40mm ones. I also ordered a Blight Drone which should be here shortly. So in the next few days I hope to get the Toads knocked out and get working on the Karrier, with the aim of getting the sponsons on the way to being done. Over the weekend a few brave souls went to Nottingham to spend three days gaming. It was an enjoyable experience and allowed me (for the first time ever) to actually field a completely painted force. Something many will find shocking. prepares another cowardly psychic attack. at the far end is Maelstrom trying to remember how to play 40k. Space Puppy Termies belonging to Nife. And the unfortunately result. Poor buggers. For this game my Daemons allied with the Corsair band, while the Space Wolves were backed up with some Orks...surely a sign that they aren't proper Marines? The Green Tide ready to roll. The Helbrute and Chaos Marine squad on the start line. The Helbrute and Termies face off. and the Burna Boyz and the Termies would of swung things 180. Maelstrom and Nife learning BFG. I'm not sure what the face Nife is pulling means. I think it is his 'thinking' look. We didn't see it often. Chaos Cruiser of Nife for the game. The best I have managed to get of the entire Plague Fleet. ...plus some recruits to the Nurgle force. Here is a basic rundown of how I went about painting the Plaguebearers (as well as the Nurglings). It should be noted that the paints I have aren't part of the all new shiney range. As such you won't be able to follow it exactly if you only have new GW paints, however it is only a guide, people should modify it to suit. Stage One - Base coats. a. Over a black undercoat the Plaguebearer was given a rough coat of Rotting Flesh, While I ensured raised areas were covered I wasn’t fussed about getting into every nook and cranny. b. Ogre Flesh wash was thin liberally applied. Still part of the 'stage 1' Leviathan Purple and Baal Red washes were used on the ‘stumpy’ legs. Stage Two - Early Details & Further Washes to Add Depth. a. Any recessed areas (such as the guts) which I wanted a different colour were blocked in. For example the guts were painted. b. This was followed by a Devlan Mud wash over the skin and the purple/red legs. 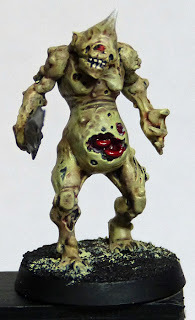 c. Rotting Flesh was then drybrushed on and/or used to highlight areas. Painting the recessed areas before the wash allows you to tidy up anything that needs doing at this stage. Stage Three - All the Details and many Washes. The guts got a Baal Red wash followed with some Leviathan Purple, before being gloss varnished. The eyes were picked out with red, washed with Devlan before highlighted red. The horns were drybrushed white so that the horns started flesh coloured and progressively becoming more white along the length. At that point the pictures stop, the fact is the rest of it doesn’t have a ‘recipe’ as such. I simply added more washes to tint the skin in different areas. Reds, blues, greens and so on followed with the occasional Devlan to add more depth in certain areas. 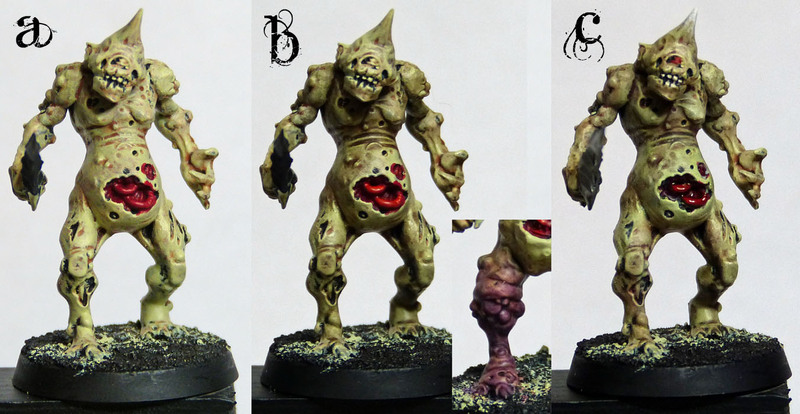 I used more Rotting Flesh to highlight before picking out the teeth and claws with white/Devlan. For the swords I base coated then in Boltgun Metal before covering them completely in a mix of different Mig rusts. The boils/pustules were painted Goblin Green and were highlighted with Goblin Green after a Devlan wash. They were later given a gloss varnish finish. After all that it was just a case of doing the base and the figure was finished. So Papa Nurgle has been smiling down on me today as the mini-force is complete. No doubt this will mean i'll be coming down with Nurgle's Rot by the end of the week. So here is the leader of this contagious gathering. Before you think I got him painted bloody quickly I should point out that I didn't paint him. He is one of five figures a friend of mine painted for me as a favour. It involved them flying out to Australia and back (obviously). Using this guy as a Herald seemed a perfect way to get one of these figures on the tabletop as an actual gaming piece. The person who painted them goes by the name of 'Sheep' or the even more rediculous name 'Aaron'. Unfortunately I had to replace the base so the figure fitted in with the other Daemons. I went with a rock base so that I could paint it seperate without any risk of getting paint on the model itself. Below you can see the original base by Sheep, when removing it I discovered the cheeky scamp had signed and dated it. At this point why not pop over to his blog Forlorn Hope to see his Krieg and Nid figures as well as his latest project, a Heresy era Sons of Horus army (including a Comtemptor dread which recently popped up on the GW daily blog). ...you back? Then we shall continue. I went through the units adding a bit of foliage to some bases. It brought in a bit more colour and make the bases a bit more interesting. Also ties in with my gaming boards nicely. Quite pleased how they all turned out. At the weekened i'll pick up some resin from FW to add two more units to the force. I plan to try and knock them out quickly. If I don't keep the ball running they'll be put in a box and remain there for months. 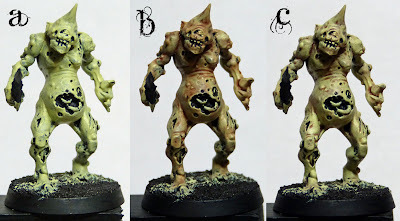 Blessings of the Plaguefather - Nurglings. Recalcitrant Daze - 18 months.